Do you really want to carry all this stuff? Here we have a few more minor rituals – so classified because, while their effects are sometimes quite useful, in game terms their results are less then overwhelming. They’re set up according to the ritual system in Legends of High Fantasy – but they should be easy enough to adapt to other systems. What keeps rituals under control in the game is that the special components required are normally entirely up to the game master. Of course, in the case of memorized rituals… the GM has already ruled. In the case of minor rituals… their effects are small enough that they’re generally self-controlling – ergo they don’t generally call for anything too awkward to get a hold of. Thus, here we have another five minor rituals. At the edge of death, as the silver cord frays and awareness of the body and it’s frailty fades, the senses of the spirit open – and the song of creation, and the voices of those awaiting, are heard. Some find in that a final bit of strength to say farewell as they embark upon their journey. This ritual simply grants a slightly enhanced sensitivity; those who accept it will begin to hear the call of the spirit world at least one day in advance of their natural death – whether by illness, age, or any other progressive effect – although it will fade if such a condition is healed. That whisper will bring them clarity of mind, freedom from pain, an easy passage – and even enough strength to set things in order. The call will fade if they get themselves cured – although, (unfortunately) any effects of over-exertion while they were feeling no pain will then catch up with them. Area: Single Living Target (+0), Duration: Years (+10), Effect: Minor (+5), Range: Target Present and Willing (-5). Clerical (God of Light, Truth, Death or other related field). Base DC 10, Requires the use of a properly-blessed holy symbol, a sacred tome, a drop of blessed oil, and a first-level “light” spell. The base time requirement is eight hours and it would be detectable within a radius of about a hundred feet. OK, in game terms… this is basically just an “I am a nice guy” credential for a priestly ritualist. There’s nothing wrong with that though. One of the more dramatic minor rituals, the Eightfold Breath of Serenity can be used to cast a protective sphere of force – quite impervious to energy and physical violence – about a target and anything up to a fifteen foot radius anywhere within line of sight. Unfortunately, while the sphere moves with the target, it only lasts for the space of a few breaths – a single combat round. 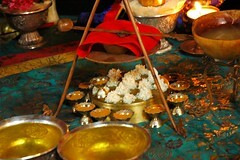 Given that invoking the ritual normally requires having it memorized (that faith in it seems to be a vital component of the effect), drawing a magical circle, lighting seven candles, and spending an hour chanting (although a sufficiently skilled ritualist can cut that down to a minute), it’s utility is rather limited. The vast majority of the time – unless you’re in bomb disposal – if you have that kind of time to prepare for a precisely-timed problem you can just get out of the way. Still, even without some method of storing ritual effects, it makes an impressive demonstration for would-be students of ritual magic and has occasional used for things like drawing fire, or permitting a safe dash across an exposed position. Small Area (+0), Duration; Moments (-5), Effect Severe (+5), Range; Line of Sight (+5). Base DC 5. Requires the use of seven candles, drawing a magical circle, and – oddly enough – having the ritual memorized. The base time requirement is one hour, and the energies of the ritual are automatically detectable by those with mystical powers within a radius of fifty feet. Now this sounds impressive – but it’s pretty hard to actually take real advantage of this particular ritual. Even rushing it, it just takes too long. This ritual transforms a spoken message of up to ten minutes or so duration into a fountaining swarm of thousands of beautiful butterfly-constructs which will travel to a designated city-sized location on the same plane, seek out a named target there – and then fling themselves at any handy solid surface, impacting in swirls of glittering dust that will spell out the message. A single butterfly will accomplish that task, but the more that make it, the more easily the message can be read. Unfortunately, while the butterflies are capable of traveling roughly a hundred miles a day, and can slip past any barrier that isn’t entirely air- AND light-tight, a dozen or so Fireballs, or a few summoned swarms of birds, or similar countermeasures can destroy the swarm handily. Even if they get through, the recipient has no easy way to reply or even to acknowledge the message – although it does leave them with a lovely (if transitory unless coated with something to preserve it) work of art. As a minor side effect, no one will be able to hear what the messenger-sender says since his or her words come out as butterflies. Living Target (+0 DC), Several Days Duration (+0 DC), Minor Effect (-5 DC), Sympathetic Link (Name and Location of Target, +15 DC) = DC 10. Base time of eight hours (may be reduced to a minimum of a few minutes plus the speaking time by a sufficiently skillful ritualist), requires a pinch each of silver, copper, and gold dust, at least five colors of ink, and a folded paper butterfly. Normally easily detectable within a radius of a hundred feet. This is dramatic and very pretty – but it’s not really that much better than Whispering Wind for most practical purposes, can be interfered with, and is pretty obvious – and it’s not like there aren’t plenty of other ways to send messages. Peering into the future is always an uncertain affair, filled with uncertainties and portents – yet it has ever been a preoccupation of magic. This ritual is, however, surprisingly reliable – mostly because it seeks mere hints and clues to things that might be overlooked in a few hours to come. Pouring the ink and oil into the waters of the chalice, and meditating upon the swirling depths will vouchsafe the user with enough information about some future event to aid in understanding it when it actually occurs – but no more. In game terms, the seer may opt to either reroll, or to “take 20″ (in advance), on an appropriate roll (Gather Information, Spot, Listen, Investigation, Search, Sense Motive and so on), made within the next twenty-four hours. Living target (DC 0 base), Duration in Days (+0 DC), Minor Effect (+0 DC), Precognitive Effect (+10 DC) = DC 10. The ritual normally requires some eight hours – and is easily detectable within a radius of a hundred feet. Obviously enough, it requires a chalice (of gold or silver), a vial of rare oil (GMO as to difficulty to acquire or refine), and ink. A skillful ritualist can bring the time down to ten minutes or so, but this is often something of a strain. Again, this can be useful – but a single, prepared-in-advance reroll for a very limited set of rolls isn’t all that impressive. Even more importantly… information is rarely all that vital. If the GM wants you to have it, you’ll almost certainly wind up with it somehow – and if he doesn’t want you to have it, a single good roll isn’t going to get it for you. This simple ritual is designed for hurried record-keepers, diarists, and similar folk with more to record than they have time to do it in. With the Narrative of Days they need merely spend a few moments focusing on recalling the information they wish to record, touch a drop of ink to their tongues and breath out across the target tome – and the pages will fill with the details of a day, meeting, or tale, complete with well-executed illustrations and decent calligraphy. Sadly, spells and similar magical information carry enough potency – even in written form – to disrupt the magic of this small ritual; it cannot be used for such writings. Just as bothersomely, unless the rite is committed to memory, it will not work. Small Area (pages, DC 0 Base), Instant Duration (+10 DC), Minor Effect (+0 DC), Target Present (+0 DC), Special Modifier (exceptionally trivial, -5 DC), always Rushed (to a mere few seconds, +10 DC) = DC 15, requires that the ritual have been memorized, but otherwise only calls for a drop of ink and a surface to write upon. Yes, if you’re a ritualist, and wish to commit this particular ritual to memory… you can regularly save a few minutes. Again, this isn’t going to break the game, even if a lot of people in real life would really LOVE to have it. When you say according to the “Legends of High Fantasy” system, could you tell me where that system is? I have the Legends of High Fantasy book but I don’t see it anywhere inside. Strange; it should be pages 108-116, under the skills section. If it isn’t there, something has gone quite wrong – and please let me know! I found it, I have one file that must have been corrupted or something. A couple questions about it now that I have found it (of course). (-), Major (+5), Severe (+10), and Grandiose (+20). Could you give spell level equivalents for those catagories? /Actual Effects). I just don’t understand the idea here at all. Is it like waiting effects such as “After someone loots this tomb” for postcognitive, “the person who would dare to touch this sword” for precognitive ? In terms of comparing the system used in Eclipse and the one in LoHF, are the number of components, 8 each worth between 0 and +5, and an undetermined but seemingly more narrow number worth from -5 to +5, along with a few other random ‘one of’ components just different in presentation, or are they both rather different in terms of how they function mechanically and in making DCs scale? As so often happens, this got a little long for comments – so a full reply is up over HERE.